Whether you have a website, blog, forum or social network, or if you are a travel agency, event organisation, company, or hotel… our affiliate program will give you the opportunity to increase your profits by selling our products to your followers or customers. 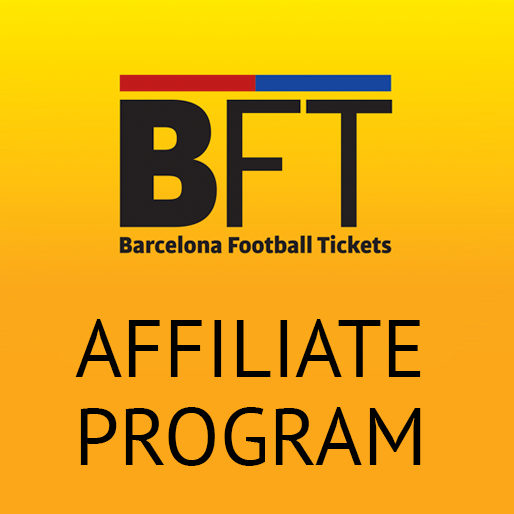 The affiliate programme from Barcelona-Football-Tickets.com is completely free and very easy to handle. In addition, we will put a series of tools (banners, private access, etc.) at your disposition and exclusive benefits (product discounts, personalised attention, etc. ), so you can get the most out of your programme. In this modality, we are the providers of tickets, tours, excursions, etc. for your agency. That means that you can choose from our entire stock of products and expand the sales offer to your own customers. You can obtain profitable discounts for our products. You decide the fees to apply for selling our tickets. Credit options for agencies that buy on a regular basis. Detailed and completely updated information on all our products. Personal support in various languages. Advertising material provided at all times. Real time function with instant sales information and order tracking. Whether you have a website, blog, forum, or social network, or if you are a travel agency, event organisation, company, or hotel …, our affiliate program will give you the opportunity to earn money any time one of your users or followers buys our products through you. This means that you earn money from every sale contracted through your web page. We manage all the sales transactions. You do not have to worry about anything. You obtain a permanently active source of income: 24 hours a day, 365 days a year. You maintain your page domain when users view the products available. You have a customised tool (private access) at your disposition to review the status of your real-time sales, orders, fees, dispatch, etc. You can customise your sales web page: customise your logo, colour scheme, banners, widgets, etc. If you would like to integrate your web page and sales even more, we can set you up with excess to our XML feed. In this case, you will have the opportunity to learn about the availability of all products on our web and decide which you want to sell. Option to create your own sub-affiliates and extend your own commercial network. Having accessed our web, click the “Affiliates” tab and select “Register”. Complete the online form with your details, indicating the desired type of affiliates programme. The Barcelona-Football-Tickets team must approve each application individually (don't worry, this is a very fast process). Once your account is activated, you will receive an automatic confirmation email with your affiliate terms and conditions, your login and password to access the private area. A little later, our customer service staff will welcome you so that we can start working as soon as possible. From then on, you can always count on us to attend to your queries at any time. If you have a web type affiliation, once your plan is activated you can access your private access to customize your sales page by selecting the banners and access widgets to the sales web, as well as your preferred logos and colour schemes.